Begin by talking to an Examiner in the Digsite Exam Center. The fastest way is to teleport to Varrock via the lodestone and walk southwest until you reach the fence/gate shortly above the desert. Walk through this gate and head west to arrive at the Digsite Exam Center. 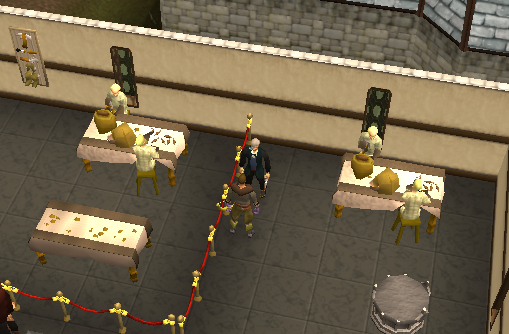 Ask about taking the test and she will give you an Unstamped Letter, which she tells you you mist show to the Varrock Museum's Curator. 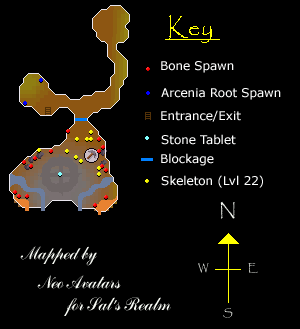 So, take the long road back to Varrock and once you enter the gates head northwards towards the Museum. Once inside, talk to the Curator who should be standing near the door so you should have no trouble finding him. After a short conversation (He will also thank you if you have done Shield of Arrav) he will stamp and seal your letter, telling you to give it to an Examiner. 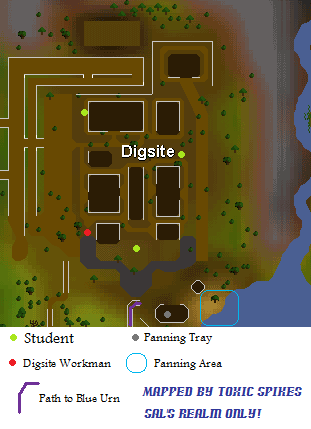 Leave the building and head north towards the Digsite, speak to each student for help. It turns out they have all lost something of value, and will only give you answers if you retrieve the item. The first student you are likely to find says he has lost an Animal Skull, pickpocket the Digsite Worker indicated on the map and you will eventually get the skull, return to the student and he will give you the answer to the first question: Earth Science is the study of earth, contents and it's history. The second student is north of the first, he has lost his Special Cup he once had won for an excellent find. Head to the Southeastern point of the Digsite and pick up the panning tray inside the tent. Walk to the panning spots to the east, but when you try to pan you will be stopped by the Panning Guide. Ask how to be invited to pan, he says the authorities must give you permission, but he'll let you pan if you give him some Tea. Give him the Tea and start panning! You might get an Opal, keep it as you'll need one later on in the quest. Eventually you will find the Special cup, give it to the student and he will give you question two's answer: People eligible to use the Digsite are: All that have passed the appropriate Earth Sciences Exams. The third student has lost her Teddy Bear and wants you to find it. Go to the south of the Digsite and go across the bridge you came from, you will see a large blue urn. Next to it are two bushes, search the one on the right and you'll find Teddy. Go back and give the cuddly toy to her and she will tell you the third answer: Leather gloves and boots are to be worn at all times; proper tools must be used. Head back to the Exam Center and take the exam again, this time putting in the correct answers. If you did it right, you will receive a Level 1 Certificate. Correct rock pick usage: Always handle with care; strike the rock cleanly on it's cleaving point. Correct sample transportation: Samples taken in rough form, kept only in sealed containers. Finds handling: Finds must be carefully handled, and gloves worn. Once again, talk to the Examiner and pass the quiz and receive a Level 2 Certificate. Speak to the three students again and obtain the answers, the Girl who lost her Teddy Bear wants an Opal, so pan in the river for one if you did not receive it when you were looking for the Special Cup. Specimen brush use: Brush carefully and slowly using short strokes. The proper technique for handling bones is: Handle bones carefully and keep them away from other samples. Sample preparations: Samples cleaned, and carried only in specimen jars. Now take the road you've gone on many times back to the Exam Center. Answer the questions correctly and you will earn the final Certificate! You can now dig anywhere you wish, and the Examiner advises you to impress the Archaeological Expert with something! First, though, show the Museum Curator the three certificates and he will reward you with either a Chocolate cake or Fruit Blast. 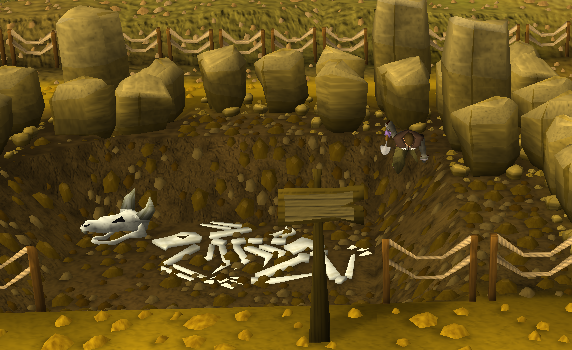 With your new knowledge, head to the Digsite and search some sacks in the northeast corner of the Archaeological dig for a Specimen Jar, and if you haven't gotten one from getting the Animal Skull pickpocket some Workmen for a Specimen Brush. Next to the bags with the Jar, you will see a level 3 digger area, enter it with your supplies and dig in the soil at the edges. 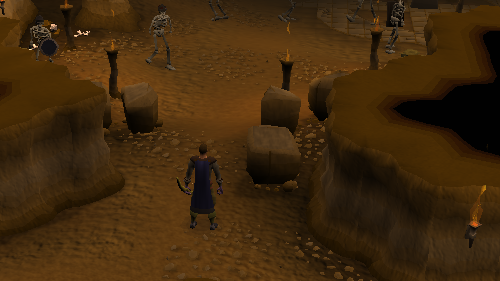 Keep on digging until you eventually find an Ancient Talisman (the Talisman of Zaros). Now, show the Talisman to the Archaeological expert back at the Exam Center and he will be mystified about the object, but will give you a letter that when you give it to a Workman, he will let you use the Private Digshafts! 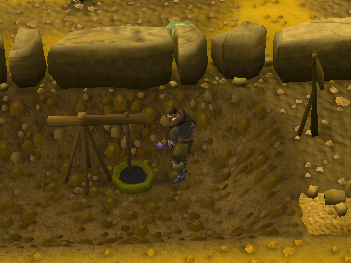 Go to the northwest of the digsite and you will see a Winch, use a rope on it and then take it to go underground to the subterranean land of... Zaros. Pick up a nearby Arcenia root, search the bricks blocking the path and you will conclude saying that it is impossible to pass. Once back on the surface, go to the northeastern Winch north of the second Student,, use a rope on it and go down. Inside you will find Doug Deeping, ask him about getting past the rocks and he will suggest blowing them up. He will hand you a key. Go into the tent in which you found the Panning Tray, use the key on the chest inside to find some Chemical Powder. Go to the barrels west of the tent and use your Trowel on the closed barrel, and then your vial to get some Unidentified Liquid. Search the nearby specimen tray and eventually you will find some Charcoal. Bring these back to the Archaeological expert and use everything (Except the Charcoal) on him. After he identifies the powder as Ammonium nitrate and the liquid as Nitroglycerin, use the powder on the liquid and use your Pestle and Mortar on the Charcoal, and use the result with the Mixed chemicals and finally the root and you will end up with a Chemical compound. Head back to the Temple and once you are up to the bricks use the Compound on them, and then use your Tinderbox. The rocks will blow, you will run for cover, the explosion giving you access to the central chamber. Walk inside. If you have 45+ combat the Skeletons won't attack you and armour isn't needed. Take the Stone Tablet in the center of the room. Quickly run the tablet to the Expert and Quest complete! 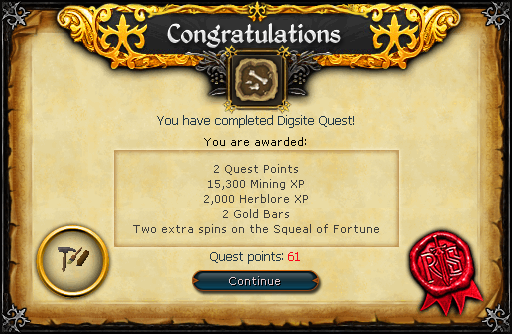 2 Gold Bars 15,300 Mining experience 2,000 Herblore experience All of the Digsite's various attractions are open to you. 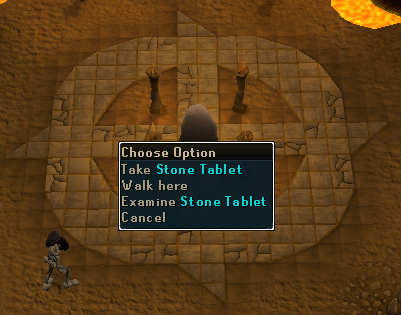 Ability to begin the Varrock Museum Mini-Quest If you have 75 in either Attack, Ranged, or Magic, you can unlock three threshold abilities by speaking with the Archaeological Expert again and reading the book he gives you. [^] Speak to an Examiner. [^] Show Varrock Museum Curator Unstamped letter. [^] Give Sealed letter to Examiner. [^] Go to Digsite and speak to Students. [^] Pickpocket Workmen for an Animal Skull. [^] Get panning tray from tent, give Panning Guide some tea and pan for Special Cup. 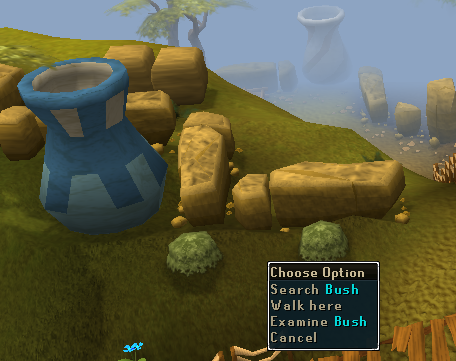 [^] Search bushes near Blue Urn for Teddy. [^] Return items to students and get Exam answers. [^] Return to students for more answers. [^] Take exam number two. [^] Show certificates to Museum Curator for Chocolate cake or Fruit Blast. [^] Dig for Ancient talisman and show to Archaeological Expert. [^] Give letter to Digsite Workman. [^] Take Northwest Winch to Zaros Temple. [^] Pick up Arcenia root and search bricks. [^] Take Northeast winch and talk to Glough Deeping and get his key. [^] Use Trowel on barrel near tents and then a vial for some Unidentified liquid. [^] Show Archaeological Expert Powder and Liquid. [^] Put powder in liquid, grind up Charcoal with Pestle and mortar. Add Ground charcoal and arcenia root. [^] Return to temple, use Chemical Compound on bricks and then tinderbox. [^] Pick up stone Tablet in center of room and give to Archaeological expert.